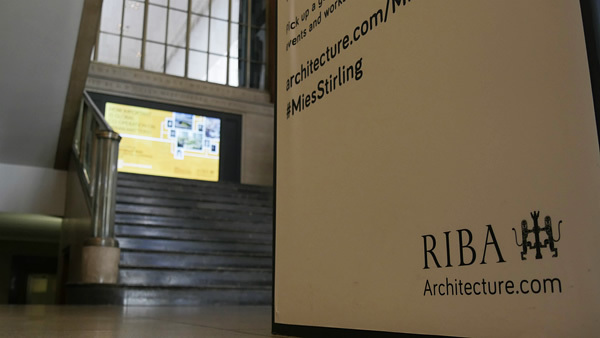 The RIBA was founded in 1834 for 'the general advancement of Civil Architecture, and for promoting and facilitating the acquirement of the knowledge of the various arts and sciences connected therewith'. One hundred years later, in 1934, it moved to its current purpose-built headquarters at 66 Portland Place in central London. Replace a ten-year-old 103-inch Panasonic plasma panel and complementary light boxes with something just as bright and vivid, but more energy efficient. Integrator Insight Visual Systems installed a statement 4K 98-inch Panasonic display in the reception atrium alongside two 65-inch Full HD panels in portrait orientation. The building, opened by King George V and Queen Mary, is now home to London’s first architectural gallery, as well as the RIBA library and its collection of over four million items. 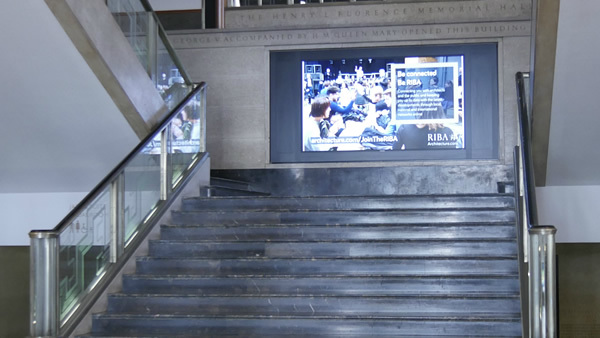 In addition, RIBA Venues plays host to hundreds of events a year and is one of a small number of venues in London offering conferencing and exhibition space for up to 400 delegates. As a result, the audio visual infrastructure is of vital importance to the Institute, forming the backbone of numerous conferences, product launches and corporate meetings. The Institute has a desire to transition to a 4K environment, with the first step being the installation of a statement 98-inch Panasonic (TH-98LQ70) 4K display within the reception, integrated by Insight Visual Systems Ltd.
"It was an easy decision to replace Panasonic for Panasonic"
With approximately 8,290,000 pixels, or about four times the pixels of a Full-HD display, the high resolution of the LQ Series produces extremely detailed images. Quadra AV designed a stunning metal effect wooden frame to enclose the display, which is mounted on a mezzanine level on the main stairs leading from reception. The large format panel is accompanied by two 65-inch Full HD panels (TH-65LFE8) installed in portrait, which replaced existing light boxes, and gives greater levels of flexibility to the installation. The LFE8 Series features a USB player. Signage operation is possible by simply inputting the desired content via USB, eliminating the need for a media player. Videos and still images can be displayed, so a wide variety of original signage content can be used. The LFE8 Series can be mounted in landscape, portrait, or multi-screen configurations and are often used for menu boards and town guide displays. With a depth of less than 62 mm, its slim design allows for discreet installation when wall mounted, and, along with the narrow bezel, helps viewers concentrate on the displayed image. "This is a very closely protected building in terms of development," said Steve Barrett-White, AV Technical Supervisor for The RIBA, "It means that we need to take any decisions regarding integrating AV within the building with that protected status in mind. "So, for instance, we are restricted on what we can put over windows to block out the light, which means displays are more feasible in many spaces than projectors. However, in most cases we're also restricted on what we can hang to the walls, which means movable screens in many rooms. "We are keen to transition to laser in order to reduce the maintenance demand"
"We had a great experience with the two 103-inch Panasonic plasma panel we purchased some ten years ago. We were expecting around three years of use, but a decade later they are still going strong. "However, we are in the process of moving away from a lot of plasma technology, to more modern, more energy efficient LCD technology, which is an important consideration as sustainability is a key corporate initiative for the organisation. "We have replaced one with the new 4K 98-inch panel and will shortly replace the other with a video wall. It was an easy decision to replace Panasonic for Panasonic." In line with those sustainable principles the organisation is also pursuing a transition to laser projection too. The first laser projector installed is within the building's main auditorium. Integrated by Insight Visual Systems Ltd, the 12,000 lumen PT-RZ12K offers 20,000-hours of maintenance free operation. It has an onboard real motion processor, which combines frame-creation and 120 Hz high-speed processing for fluid motion reproduction. "We've been incredibly pleased with the RZ12K, it creates an incredibly vibrant, bright image. We are keen to transition to laser in order to reduce the electrical and maintenance demand within the building's AV infrastructure," adds Steve Barrett-White. In terms of other AV installations within the building, The RIBA has a 10,000 lumen PT-DZ10 in Florence Hall and has three PT-VZ575s within the staff canteen in an adjoining building, which the organisation uses for staff briefings. Ceiling hung and utilising the horizontal, vertical, and corner keystone correction as well at the curved screen correction, the AV team have created a wide angle projection along a curved wall. Steve McNally, Business Development Manager at Insight Visual Systems Ltd, added, "We've helped The RIBA to integrate AV technology cleverly to create a very attractive events space that is sympathetic to what is a building of real heritage." We have replaced one with the new 4K 98-inch panel and will shortly replace the other with a video wall. 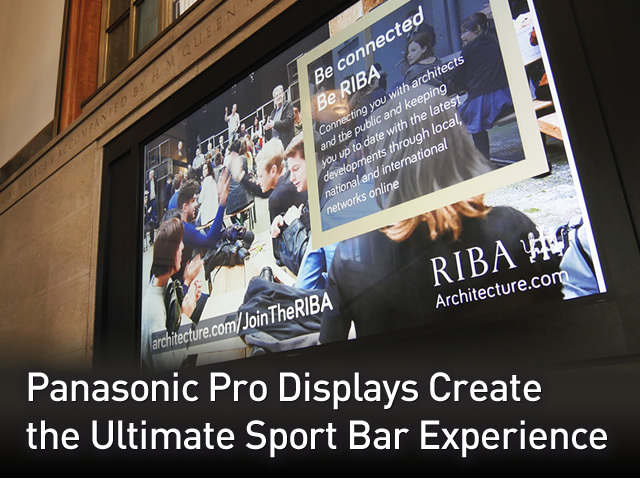 It was an easy decision to replace Panasonic for Panasonic — Steve Barrett-White, AV Technical Supervisor at RIBA.